some may also find of interest. the respect with which the people of the Empire held their military forces. well as against sea-borne raiders. allies used watercraft of this type in their first raids. stop. In 367 CE a new set of raiders, the Saxons, joined in. and thus the area would have been left open to Pict and Scot advance. appear to have used the Deisi people in a similar fashion. Fergus, a son of Connaill Gublan, a son of Niall of the Nine Hostages. enclave, and thus greatly affected the later course of history. redness; and becoming greatly afraid he quickly fled away. depend on whether Istria was within the borders of Italy between 563-597 CE. common parent body, an impact which Balbalus may have noted. while the confirmation itself is likely first hand and is somewhat later. WHO, WHAT, WHERE, AND WHEN???? of this fire, so it must have come from God. there, Gregory surely would have told us much more about it. later, this is almost certainly the case. the impact occurred at threshing time: August 10 or so, anyone? consequences, of which more shortly. geographically, then an alliance between them against Rome could occur. could then use their control of an area to emigrate into it. throughout it, thus reducing their regional concentration in Gaul. brought in other germanic mercenaries to defeat the Francs. River by gaining control of some of the cities along it. Burgundians were also able to establish control over the Rhone River Basin. involvement in it, even though its contribution to that history is pivotal. which these histories are written in the future. Gregory’s account (Gregory of Tours, History of the Franks, IV.31, O.M. the lamps that were alight. sovereignty of the areas held by the Visigoths. to those cited by C.E. Britton for the period from 480-650 CE. eruption in Java ca. 593 CE will be set out below. (marks), if anyone wanted to wash away, became more and more apparent. followed by an unbearable fever, so that upon the third day the man died. But if anyone should pass over the third day, he had a hope of living. day all had departed and everything was in utter silence. and its shinning grapes remained undisturbed while winter came on. do not seem to have been immediately affected by an outbreak of the plague. the term loosely) those parts which for the most part were Saxon. increasingly powerful seat of the Church. were not particularly welcomed by them. control of the Empire proper. the southern routes to the borders of Italia. the south of Bordeaux the Visigoths held the north of Spain. Brittannia presents itself as the most likely source. he was on his way to them he was re-called by Benedict to Rome. with their brethren already living in the north of Gaul with Chilperic. Theuderic lived the life of an exile. but Chilperic declined to treat with them. me as visible before the calamity in Auvergne. slew the greater part of them. having been made, the army withdrew from the region. then to have been expanded upon. Psalm 44 is given in Appendix I here. Gironde will be set out below. from the Pope at Rome. great thunder-claps in the month of January. Trees blossomed. pustules and tumours; but many, taking precautions, escaped. above), but instead matches the events of the annal entry for 580 CE. “In this year again appeared the following portents. The Moon was eclipsed. however, that all the sacred vessels were saved from the flames. inhabitants, undermining parts of the city of Lyons. their wake the local inhabitants and their cattle. it must have come from God. destroyed by impact. A second one will be given here later. by the thieves who crowded around. by that blast and immediately buried, and thus remain preserved. 585 CE – AN INTERSECTION WITH A COMET’S DUST STREAM? As Phil Burns has noted, Gregory Of Tours also described an event dated ca. entry in full. (Gregory of Tours, History of the Franks, VIII.23-25, O.M. covering the near fields and crops, wrought much destruction. son of King Childebert, was announced. earth with sparkling and thunder. Hahnsche Buchhandlug, Hannover, 1978, pages 127-128.
country seats, and at the same time a great destruction of men and animals. Verona itself were partly demolished by the same inundation. months after this, the city of Verona was in great part consumed by fire. quickly made contact with the Angles. 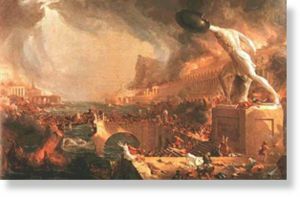 594 CE – A MASSIVE VOLCANIC EVENT? seen in the east, while Gregory’s rays in H.F. VIII.17 come from the north. days during which his obsequies were celebrated in due ecclesiastical form. witnessing this event was enough to kill Columba. 594 CE – LIGHTS AND A COMET? in addition to Fredegar’s comet. Note the western approach of the bolides and meteors. 645 CE – ADOMNAN’S PERSONAL BIAS: AN IMPACT IN DYFED? Phil Burns earlier noted this entry from the Anglo-Saxon Chronicle: “A.D. these reports may refer to the same event – but then again they may not. But these matters are beyond the scope of this survey. their transmission, and these biases must be watched out for as well. lived in either Brittannia or Hibernia during these times. poems of the bards of the different Celtic tribal courts. open the gates of the heavens. fill the air with I don’t know what kind of chants and hymns of triumph. the King wished to speak, and that they had not seen anyone resembling them. what was happening. He told him again that he saw nothing. demonstrated, was of great merit, sought to catch these on a silver plate. reuniting, formed a magnificent jewel. of the futile arguments raised against it. it in adoration to the people. destroyed the city following the impact. information regarding the impact in Bazas, but it is unavailable here. here, as are the archaeologists themselves. Guntram Boso, and any records of Columba from those of Columban. A useful technique for working with these texts must also be mentioned here. either a people or a leader. those people, and drove them out. THE LIGHT OF YOUR COUNTENANCE did this, because you had favor for them. enemies, and have shamed those who hated us. have cast us off, and put us to shame, and do not go forth with our armies. reproach to our neighbors, a scorn and a derision to those who are about us. THE PLACE OF DRAGONS, and covered us with the shadown of death. “Awake! Why do you sleep, O lord? “Arise! Do not cast us off forever! our soul is now bowed down to the dust: our stomach cleaves to the earth.